Due to route rationalization, Airblue will be suspending flights between Pakistan and the United Kingdom effective on January 22, 2014. 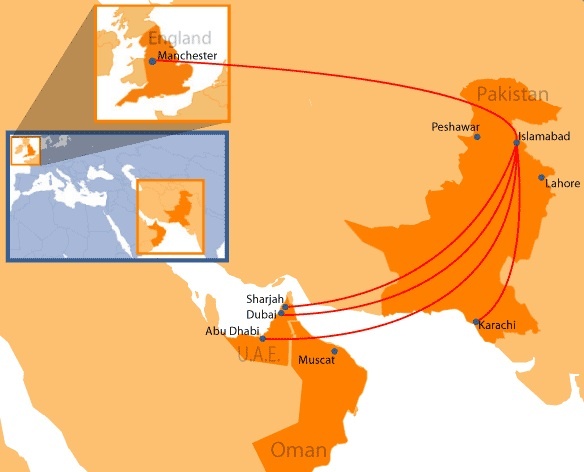 This includes the Lahore-Manchester and the Islamablad-Manchester routes. Passengers holding tickets issued by a travel agent for flights on or after January 22, may contact their travel agent for full refund without cancellation fees. Passengers holding tickets issued directly by Airblue may contact Airblue directly for full refund without cancellation fees. 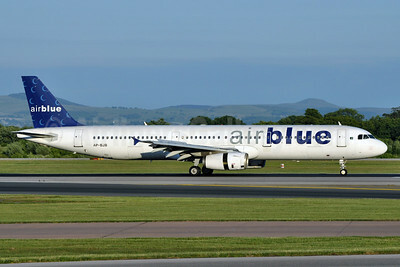 Airblue is now concentrating its fleet around the Airbus A320 after returning both A319s. Copyright Photo: Nik French/AirlinersGallery.com. 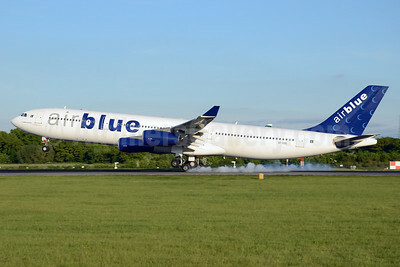 Airblue was leasing two Airbus A340-300s for the routes. Both are now being returned with the retirement of the two routes to Manchester. Airbus A340-313X AP-EDE (msn 216) lands at Manchester. This entry was posted in Airblue and tagged 216, A340, A340-300, A340-313X, Airblue, Airbus, Airbus A340, Airbus A340-300, AP-EDE, MAN, Manchester on January 21, 2014 by Bruce Drum. Airblue’ (Islamabad) flight ED 202 crash of July 28, 2010 has been investigated again by the Civil Aviation Authority (CAA) of Pakistan and the blame has clearly been placed on the captain in the second report. The Airbus A321 crash killed all 152 passengers and crew members on board. The first investigation report was rejected by the court. The CAA concluded the “Airblue crash has been finalized as a case of Controlled Flight into Terrain (CFIT), in which aircrew failed to display superior judgment and professional skills in a self-created unsafe environment. In their pursuit to land in inclement weather, they committed serious violations of procedures and breaches of flying discipline, which put the aircraft in an unsafe condition over dangerous terrain at low altitude.” according to this report by DawnNews. The CAA also concluded the captain was ignoring the requests of ATC and was condescending towards the first officer. This entry was posted in Airblue and tagged Airblue on April 25, 2012 by Bruce Drum. Airblue Airbus A321-231 AP-BJB (msn 1218) MAN (Richard Vandervord) (crashed near Islamabad on July 28, 2010), originally uploaded by Airliners Gallery. The government of Pakistan has informed the Peshawar High Court that it has decided to conduct another investigation into the Airblue (Islamabad) flight ED 202 crash on July 28, 2010. The Airbus A321 crash killed all 152 passengers and crew members on board. The first investigation report was rejected by the court. Copyright Photo: Richard Vandervord. Please click on the photo for additional information on the crash. Click on the map to expand. This entry was posted in Airblue and tagged Airblue on February 22, 2012 by Bruce Drum. Airblue’ (Karachi) flight ED 202 operating from Karachi to Islamabad crashed this morning while on approach to Islamabad. Copyright Photo: Richard Vandervord. A321-231 AP-BJB (msn 1218) is pictured at Manchester prior to today’s accident. This entry was posted in Airblue and tagged 1218, A321, A321-200, A321-231, Accident, Airblue, Airbus, Airbus A321, Airbus A321-200, AP-BJB, Crash, Crashed, MAN, Manchester, Richard Vandervord on July 28, 2010 by Bruce Drum.